As a church, we center our ministries on discipleship and mission in community. Most churches center on worship. We worship together monthly response to what God is doing around us, in us, and through us. Mike Breen and the talented folks at 3dm have developed some shapes that we use as tools that help us think about discipleship and how we do life together. Here’s the first. It’s called the Up-In-Out Triangle. Easy enough. Jesus told us to make disciples (Matthew 28:16-20) So this is how we try to do that in our missional communities/microchurches. First, we recognize that Jesus lived a 3 dimensional life. So we try to follow Jesus by living out a 3 dimensional ministry together. 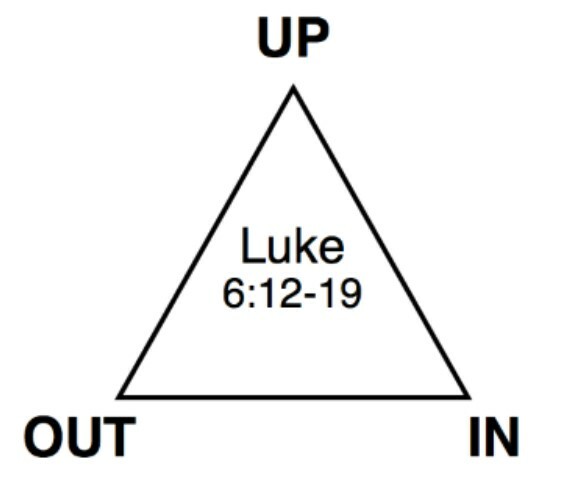 UP: In Luke 6, we see Jesus going up on the mountain to pray. “Up” refers to prayer, worship, Bible study, and seeking God. IN: Then Jesus named each of the twelve disciples. He formed a group to be with them. “In” refers to doing life together, eating, sharing, praying for one another, supporting one another. OUT: Finally, Jesus goes down the mountain with the disciples to meet the needs of the crowds, to heal, teach, and restore with God’s grace, love, and power. If a disciple is someone who learns to imitate Jesus, then we believe all three dimensions need to be in place in our lives. So we are very intentional about giving energy to each of these dimensions. If you try it, you will likely find one of these dimensions to be more challenging. Most Christians do one or two pretty naturally. For example, being good and worship and prayer (Up) and spending time with people (In), but not so good at being public about faith (Out). For that person, being in a group that does “Out” intentionally can be a little challenging. But that’s natural. Things feel awkward when we aren’t used to them. And we understand what that’s like. We’ve been there. As we’re learning, we try to be like a family where we challenge one another to take responsibility and learn new things, but to do so with a supportive environment where relationships come first and everyone has a place at the table.